I bought lots of veggies at the asian market when I got back from the UK knowing that I wanted to make a stir fry. I used a recipe from Simply Recipes and added more vegetables like carrots, broccoli, green beans, and sugar snap peas. While you are chopping the ingredients in preparation, bring a small saucepan of water to boil. Parboil the asparagus pieces for 2 minutes, drain, rinse in cold water, drain, and set aside. If you are planning to serve this dish with rice, in a separate pan, prepare 2 cups of white rice, following the instructions on the rice package. Prepare the All Purpose Stir Fry Sauce by combining the ingredients in a small dish, and set aside. Stir-fry the asparagus in a wok (or a thick-bottomed pan with at least 2″ sides that can take high heat) in 1 Tbsp of oil, on high heat, for about 2 minutes until lightly browned. Remove asparagus from pan and set aside. Add another 1 Tbsp of oil to the pan and stir fry the beef strips, in 2 batches, for 2-3 minutes until browned but still pink inside. Return the first batch of beef to the pan and add the bell pepper. Stir and toss over high heat until just beginning to wilt, 1-2 minutes. Quickly stir the cornstarch liquid and add it to the pan along with the stir fry sauce. Cook until sauce thickens, 1-2 minutes. Return the asparagus to the pan, toss to evenly coat and serve with steamed white rice (unless you are going low-carb, in which case, leave out the rice). The husband typically takes the leftovers to work along with some rice. If there’s anything left after that, I try to remix it and add it to my salad/sandwich/pita pizza for lunch. I warmed up the food and ended up putting the leftover meat and veggies on a bed of salad. I took the sauce from the stir fry and added some sesame oil and olive oil to make it more salad dressing like. 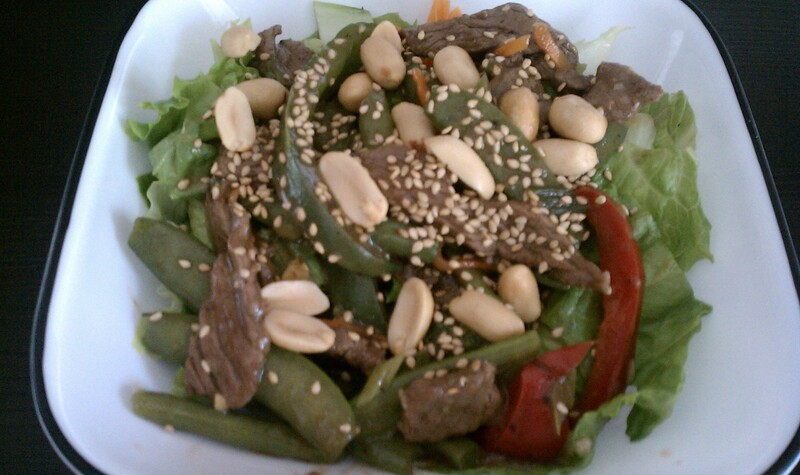 Then I topped the salad with some sesame seeds and peanuts. 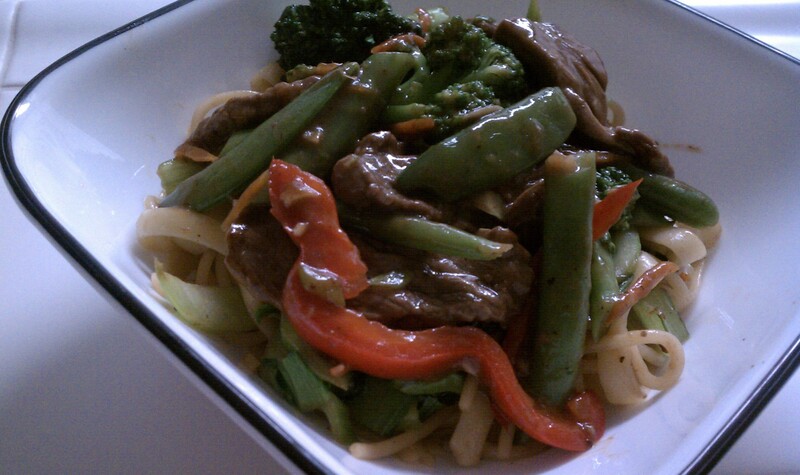 You are probably weirded out by warm stirfry on a salad. Doesn’t that wilt the greens, but wilted greens are delicious even on salads especially on romaine lettuce or arugula.